In the season of temptation I always like to have a few recipes on hand for last minute party invites or just to feel festive. This recipe can be whipped up in no time and is a spin on an old classic. Break it into small pieces for a party dish or break it into large pieces and give as a gift. Chocolate-y and refreshing, your holiday season just got that much tastier. Line a 7 x 9in pan with wax paper. Crush mints into tiny pieces by placing in a bag and gently tapping with a hammer. Pour melted chocolate into pan. 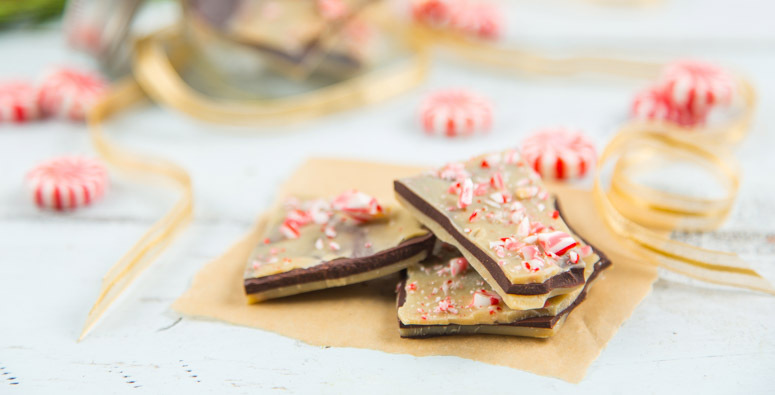 Sprinkle mints on top of chocolate. Gently press to make sure they are securely set. Place in freezer until hard. About 20-30 minutes. Remove from freezer and break apart. Crush the mints into tiny pieces by placing in a bag and gently tapping with a hammer. To temper white chocolate layer, roughly chop cocoa butter. Reserve one third of chopped cocoa butter and melt remaining two thirds in a double boiler or microwave. Once melted, remove from heat and stir in remaining one third of chopped cocoa butter and stir until fully melted. Add salt, vanilla extract and macadamia nut butter. Stir until completely combined. Spread ¾ of white chocolate mix on prepared wax paper. Place pan in refrigerator. Reserve remaining white chocolate mix for top layer. Roughly chop Vega Maca Chocolate bars. To temper chocolate, reserve one third of chopped Vega Maca Chocolate bars and melt remaining two thirds over a double boiler or in the microwave. Once melted, remove from heat and stir in remaining chopped Vega Maca Chocolate bars. Stir until fully melted. This will ensure chocolate sets and retains a good snap..
Pour melted chocolate onto set white chocolate layer and spread to cover completely. Return pan to refrigerator. Once Vega Maca layer has set, pour remaining “white chocolate” on top and spread evenly (you may need to remelt the white chocolate layer). Sprinkle mints on top of “white chocolate”. Gently press to make sure they are securely set.